Bronx-born Ronnie DeNota grew up in the Catskill mountains, Town of Swan Lake. 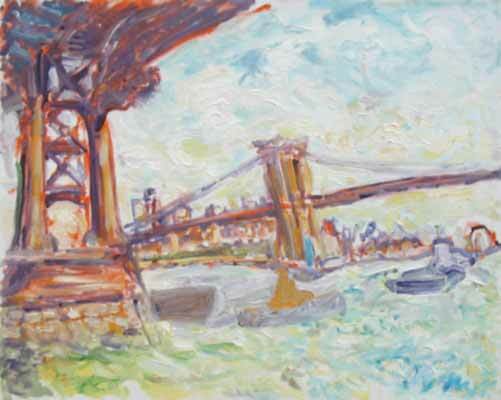 He has for years forged a neo-impressionist style based on working directly from nature. He was painting the City as part of organic nature. DeNota has devoted his energy to the expression of his feelings. By using nature as a vehicle for art he is able to hone his expressions in an experimentally spontaneous way. The overall effect is one of joyous celebration. Oil on Canvas- 22" x 28"
Ronald DeNota, painter of the New York scene, and a member of the Street Painters Group since 1978 will be very much missed. He passed away on Thursday, January 4, 2007 at 8:50pm. He passed peacefully in his studio home, in Greenwich Village, with Lucy and friends, and amongst his many beautiful paintings. He was very much loved by all who knew him. 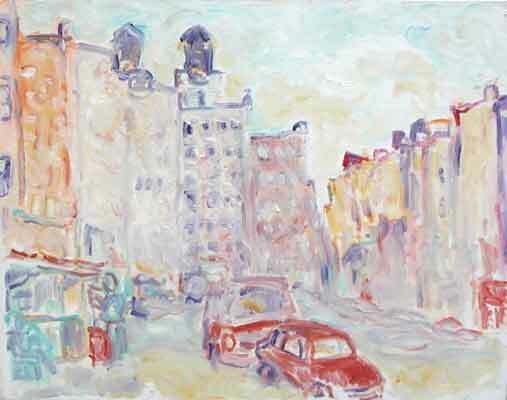 Born July 17, 1928 in the Bronx, he lived to 78 and he was the most exceptional of painters.